Writing With Mentors, in part, is about what this flow of mentor texts looks like in our classrooms. One of the best things about making mentor texts a centerpiece of your writing instruction is their versatility; mentor texts meet each student exactly where he is. They provide the ultimate inspiration and ultimate differentiation simultaneously! So, while our elementary and middle school counterparts will want to swap out the Grantland article we use with our high schoolers for a piece from Sports Illustrated Kids, the approach we take to infusing the entire writing process with mentor texts is universal. Our book is chock-full of details about how we introduce these methods to our students, how we instruct at each step, how we confer with students as they move from play to publication, and how we teach students to be independent so that they can take mentor texts into their writing future long after formal schooling is over. Today, we want to show you the bones of our approach to mentor texts and help you imagine what each phase might look like in a classroom of younger students. Notebook Time is a regularly-scheduled playdate with words, mentors, and ideas. Since mentor texts both inspire and instruct writing, Notebook Time is a perfect time for students to dig into short mentor texts and try them on for size! This notebook play will not only expose students to new techniques and build their confidence, but will also begin to spark ideas and build a foundation for future pieces of writing. Pull an evocative but simple sentence from one of your mentor texts — a children’s book, a nonfiction article from a children’s publication, or even your class read aloud! (Read alouds make for great peripheral mentor texts to supplement the texts you are formally studying in your writing unit.) Project it for your students, let them notice its parts and pieces, and then try their own version in their notebooks. Children’s news publications like National Geographic Kids, Time for Kids, and Sports Illustrated Kids use the same kinds of charts and graphs as adult publications. Choose one that you think will pique your students’ interest. Give them time to observe and jot down their observations. Prompt deeper thinking by asking them: what is this data trying to say? What does this data make you wonder about? What kind of writing might be inspired by this data? What portrait, photograph, or work of art might inspire writing in your students? Any powerful image will do, but you might consider increasing students’ engagement by using images that include children. Brandon Stanton, the creator of Humans of New York, often features children in his daily captioned photographs. He also has a book focused solely on the stories of children: Little Humans. Mentor texts have almost always (and almost exclusively) been used at the beginning of the writing process. Regardless of the complexity and sophistication of the piece being planned, all planning is essentially the same. Studying a stack of brand new children’s books, or poems, or informational articles from children’s periodicals can help your students find ideas, can introduce them to the conventions of a genre, or can help them sketch out a plan for the structure of their draft. Drafting and revision are also an excellent moment for grouping students together for peer feedback and even deeper study of mentor texts. Have your students choose one of the mentor texts the class has studied as their “touchstone text”, a text they will study more closely and rely on as they work toward publication. Students who have chosen the same touchstone text make a natural group. We all know that students learn the most about grammar and punctuation in the context of real writing. Use your mentor texts to demonstrate punctuation rules and other usage that your students need to master. Fonts, margins, images, hyperlinking, layout, audio — mentor texts show students real-world options for adding meaning to their words as they consider how presentation affects the reader’s experience. Finding opportunities for publication as real and authentic as the mentor texts you are studying is incredibly motivating for your students. Many of the sources from which you will pull mentor texts also offer opportunities for students to submit their work — Highlights features poetry, art, and stories by students. Time for Kids has a team of “kid reporters”. Even the Scholastic writing awards can excite students with the possibility of their writing being read far beyond your classroom walls. Play, planning, drafting, revising, publishing, studying the work of other inspirational writers — these are the rhythms of all real writer. They aren’t cordoned off to elementary school, or middle school, or high school students. 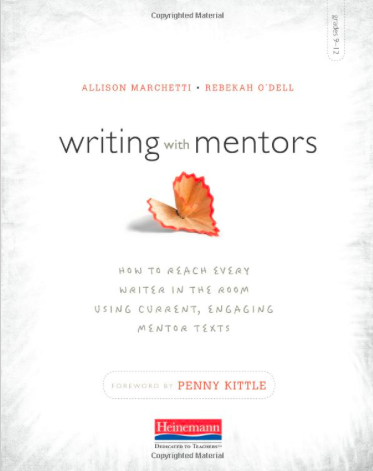 Find recently published, developmentally appropriate, and engaging mentor texts for the students sitting in your classroom this year, and then infuse those mentor texts into every facet of student writing. Mentor texts change. The lasting impact of using multiple, hot-off-the-presses mentor texts from play to publication doesn’t. We are hosting #elachat next Tuesday night (9/29) at 7pm CST! Join us as we talk about using mentor texts to engage every writer in your classroom! In the meantime, we’d love to hear your comments and questions about writing with mentors in your classroom! Please leave a comment below or find us on Twitter @rebekahodell1 and @allisonmarchett. I need the deck, so I can market efclifentiy. Publishers never send me advanced copies, so my marketing is always late and lame.So help me help you sell the deck. Provide me with advanced copies please!